Source and .exe are both included. If running this program under Windows just to see what it does, make sure you hit ALT-ENTER so it is running fullscreen before you answer the initial hardware compatibility question. Otherwise the colors will be wrong, as it will be running in a window and using the incorrect Windows palette (instead of the VGA card's BIOS colors). To anyone who looks at the CGA pinout, it appears that the logical color for #6 would be dark yellow instead of the much darker brown we are familiar with. 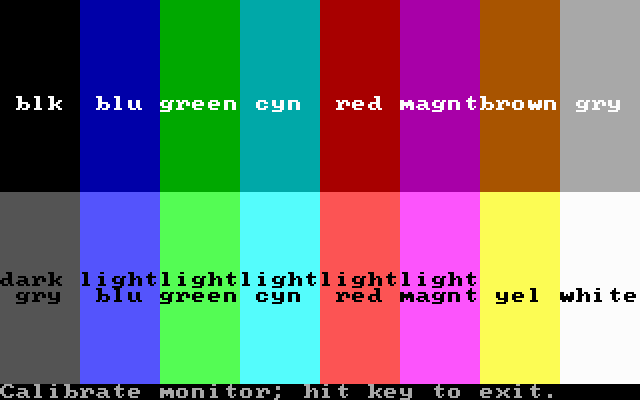 But CGA monitors display brown, not dark yellow. How? It turns out that the monitor does the translation, and IBM intentionally added logic in the monitor to decrease the green component on color #6 so that it would appear brown. Let's start on the CGA card itself. The attribute data from the video RAM is latechs in U35 ('273). The outputs of that go to a 4-bit 4-way multiplexer (U9, U10, '153), which, selects one set of 4 bits or the other depending on wheter that particular dot in the characer cell is set or not (OK, there's a lot more to it, blink mode, graphics modes, etc, but I don't want to have to explain all 6 pages of the schematic at this point). OK, so why the odd name for color 0 1 1 0? Well, we now turn to the schematic of the CGA monitor. 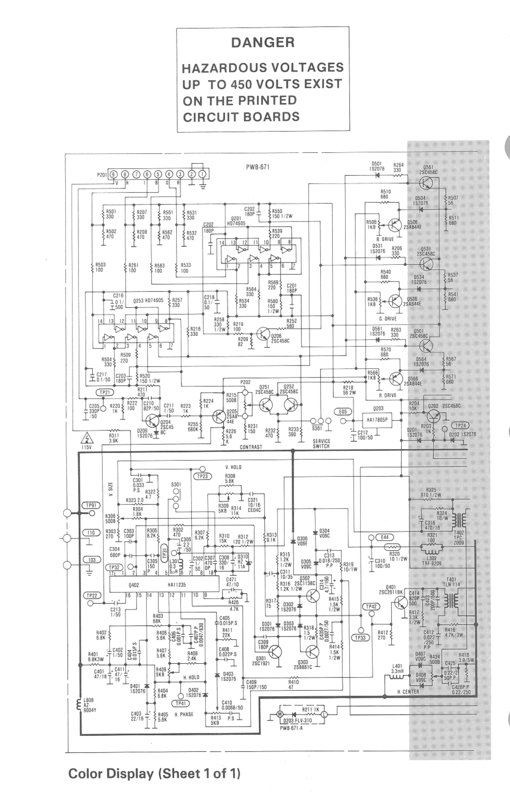 The 4 bits come in, and are buffered by 74S05 chips, Q201 and Q253 on the schematic. Now for the interesting bit: There are 4 of the open-collector inverters -- Q201d, Q201f, Q253e and Q253f -- whose outputs are connected together. This common signal will only be high if the input signals are... wait for it... I=0, R=1, G=1, B=0. That is, for this particular color 6. For that color, Q206 (a normal NPN transistor) is therefore turned on, and this will reduce the level of green in the final display. In other words this color is a little redder than you might expect. So there's the magic: IBM intentionally turned #6 brown in the monitor. ...but the monitor does. It contains circuitry to shift that color a little towards the red. Of course, there is still one unanswered question: Why did IBM go through the trouble of turning #6 from dark yellow to brown in the monitor? While I haven't been able to verify it absolutely, evidence strongly points to IBM doing this to more closely emulate the colors produced by the IBM 3270 terminal.